What Is Content Marketing for Roofing SEO? One of the common SEO mistakes that we see roofers make — and all service providers, really — is relying on a stagnant website and overly salesy content. Sure, you may check the box on social media marketing and even publish a steady stream of blog posts, but just going through the motions is not going to keep your phone ringing. If you’re doing the bare minimum, you’re going to find it impossible to stand out from the pack. 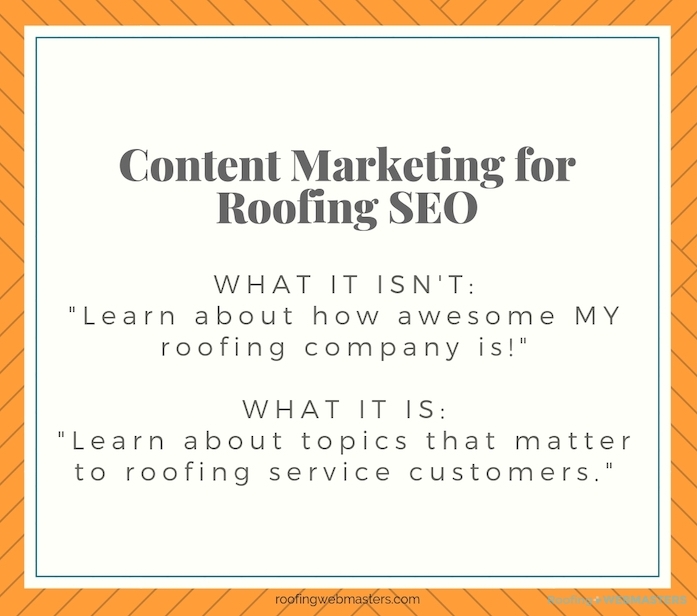 However, if you up the ante and want to really show up for potential customers, then Content Marketing is the way to take roofing SEO to the next level! If you publish a webpage on your roofing website that is all about why you are the best company in all the land, then you’re engaging in traditional marketing. And while there is a time and place to laud your accomplishments in credentials, you want to try to subtly weave that into content, versus presenting a straight-up sales pitch. Because — tough love moment — no one is sticking around for the latter. However, if you publish blog after blog highlighting some of the most common topics that actual clients bring your way as you help them with roofing repairs and replacements, then you’re dabbling in content marketing. When you’re trying to raise awareness of your brand (your roofing company) by creating quality content — be it for your Facebook Page, blog posts, throughout your website, or even on citation listings like Google My Business — you’re putting the emphasis on delivering information that is valuable to potential customers, versus straight up hawking your roofing services. There may or may not be an explicit call to action, but you’re talking about what you know (roofing), and your customers are better equipped for a purchasing decision because of it. The key to great content marketing strategy is value. With every piece of marketing material that you (or your website management team) puts out there, the goal should be providing value to customers. But don’t misunderstand that this is still marketing. The goal is more business, repeat business, and encouraging quality roofing leads that convert to sales. However, the point isn’t to beat a reader or follower over the head with your particular brand, but to regularly show up and provide such helpful information, that when the time comes to pull the trigger on roofing repairs, they trust you to do the work. In fact, content marketing is the best approach to take when it comes to cultivating a loyal referral base. When clients utilize your company for their roofing needs, be sure to capture their email address or social media handles so that you can continue to interact with them beyond the sale. This will allow you to keep serving up great content to protect and maintain their roof (value to them), while also keeping you at the forefront of their minds if/when someone needs a roofer referral (value to you). It’s an absolute win-win! How Do I Implement Content Marketing For My Business? So glad to hear you’re on board for this strategy! Your customers will thank you, no doubt. One of the most immediate ways you can incorporate content marketing for SEO is to leverage your blog. If you’re not a regular blogger, you are missing out. First, a note: we don’t expect that you are going to drop your tools on a weekly or monthly basis to sit down at your computer and draft a blog post for your roofing website. One of the best investments you can make is to delegate the on-going, detailed management of your website so that you can continue to focus on your business and your customers. Hiring professional content writers is a wise move to stay on top of current best practices (which often shift based on the latest search engine and social media algorithms) and ensure that each post is optimized to run free and dominate in search rankings for the queries you’re satisfying. Don’t fall behind in the competitive market by churning out generic, worn out topics for your industry. It may seem helpful to have the most basic questions/needs to be addressed, but do that via optimized webpages for your website; not on your blog. This is a strategic move because it keeps that evergreen yet check-box-type content that everyone expects within your core website offering, which is great. However, every blog post is an opportunity to uniquely capture the attention of potential buyers by honing in on a specific topic or question. Think about what customers may search for in order to land on your site. Those exact questions and phrases are what should be used as the blog post titles (and H1s) of your article! According to the recent post by the Content Marketing Institute, one of the biggest mistakes in trying to crank out this type of marketing is creating content that no one is searching for. While it’s great to focus on a topic that comes up a lot on sales calls or from Facebook Followers, if you don’t use the right keywords, you could miss out on a ton of traffic. How much better it is if your blog posts, for example, are optimized to utilize the strongest keywords for roofing in the title and throughout the post. Now I will never (nor should anyone in 2019) recommend stuffing a bunch of these keywords into every other sentence of a given post. Not only is this jarring to read for potential customers, but it can actually hurt you in the rankings as Google picks up on signals that your content is crap. You’re not fooling anyone, and it won’t work. 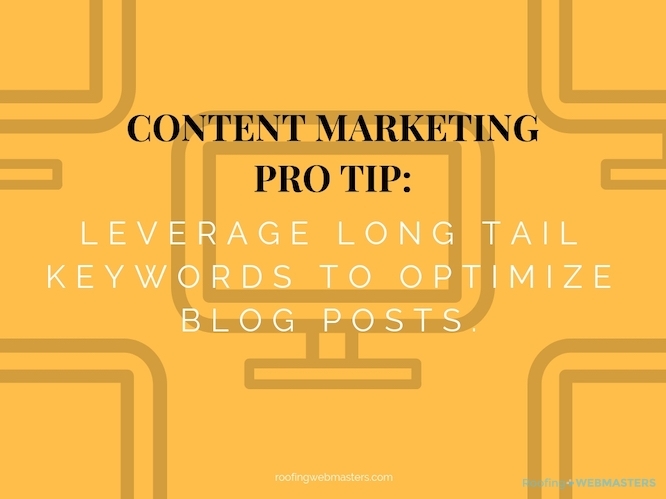 Instead, grab some of those great roofing keywords and think about how you can create “long tail keywords.” These are basically phrases that reflect real queries from customers who would benefit from the content you’re producing on your website, blog, or social media pages. Don’t abuse the term “metal roof” just because that’s a massive trend at the moment. But you can still snag some of that traffic by focusing more specifically on a subject about metal roofs, such as the pros and cons of metal roofs, or 5 tips for maintaining metal roofs to last. Another key way that you can implement content marketing into practice is to stay focused on delivering value across your social media channels. Consider what customers want, what they call about, what concerns and confuses them about roofing, and let those ideas fuel your Facebook Ads and LinkedIn posts. Because many social media algorithms, such as those used by Facebook and Instagram, favor meaningful interactions (comments and shares) versus passive engagements (likes or views), it’s important to create and curate content that encourages response. After all, social media should be social. How Do I Get More Engagement On Social Media? We get it: you’ve paid for the Facebook ad and want to see it take off. But realistically, folks today are exhausted from being constantly advertised to. They can skip your ad, even if it does show up in their feed, and it’s really difficult to get the attention of the millions of users on any given platform. One way that you can get better engagement is to…engage. You go first! Comment on posts, share good content on your page that dovetails with the roofing services you offer, respond to Direct Messages, and Re-tweet. Whoever manages your social media pages should be positioned to stay plugged in fairly regularly to demonstrate that you’re not just there to ship ads and try to make sales, but that you genuinely value the community. This will go a long way in getting followers, which is basically a built-in referral network that you can “work” and nurture for steady leads all year long! It’s no secret that Google values the user experience and providing great content to those who search on it (and the other major search engines) on a regular basis. Knowing that is important to the giant that is Google, it should be vital to how you approach SEO for roofing. Content marketing appropriately keeps the focus on the customer and how business owners and brands can appeal to new clients by valuing the relationship over the sale. But have no fear: the sales follow too, and you can build a really successful roofing business on this model. One in which you’re as invaluable to your customers as they are to you.